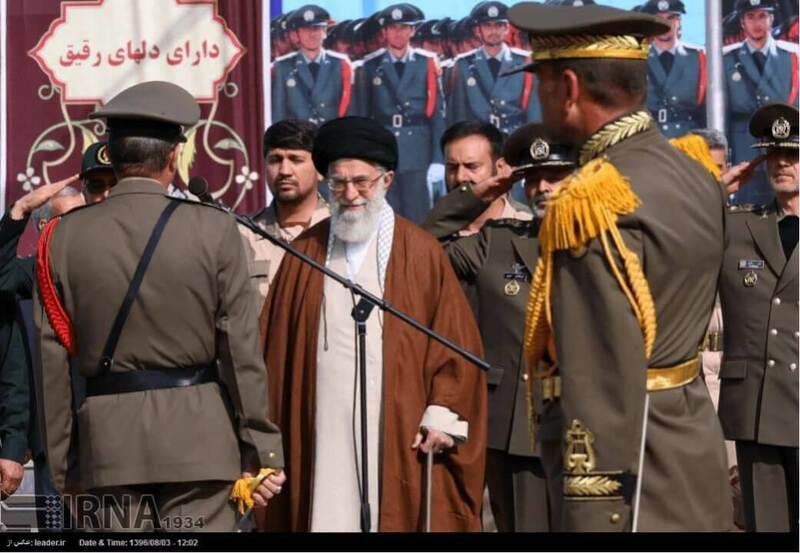 Ali Khamenei beams, deeply satisfied, in the company of military. In Iran, water supply, sewage systems, and pollution issues are the poor relatives compared with the megalomaniac project: conquering the Middle-East and ushering a new era of colonialism. At the same moment, 20’000 households from Hormozgan, in want of water, have left their drought-stricken villages to settle nearer to urban areas. They are bereft, insecure and despairing migrants left in the streets to beg. The Islamic laws, enforced into civil law in Iran, have a long list of deeds and objects that are either forbidden, Haram حرام (wine, gambling, pork), or unclean, Najis نجس‎‎ (things that cannot be purified: faeces, dead bodies and non-believers). As Iranians, we like to believe our country is the land of flowers and nightingales, گل و بلبل, equivalent to the land of milk and honey. However, observing dry riverbeds filled with rubbish, water shortages, air pollution and the insidious advance of the silent killers, one may want to think differently. The slogans repeated ad nauseam by the Iranian officials glorifying the Islamic Revolution values are deceiving. They promise a lot but deliver little. The Islamic laws fall short of cleaning the environment and the beliefs contradict the facts. The ayatollahs are running out of religious metaphors for the evolution of Iranian society as it is today. The protection of nature was unheard of in AD 622. There is no Koranic verse, no narrative (Hadith) from the Prophet Mohammed, and no anecdote from the Twelve Imams on PET littering, asbestos use, the depletion of water resources, and … the disposal of radioactive waste. Is PET Halal or Haram? How does one qualify the bloated stooges’ contribution to the soaring pollution? Is it Halal or Haram? The meagre alibi actions to preserve the environment are best represented in the pictures in which, one can see Supreme Leader Khamenei and President Rouhani, planting a little tree. Two lonely saplings to save 1.6 Mio m2 (4 times the size of France) of polluted and dried environment. Compare them with the pump when both are in the company of military. Two lonely saplings planted would not be enough to awaken the consciences. When the theocracy spends billions on military developments and religious ceremonies in Iran, Syria and Iraq, the sapling’s price is reduced to a fraction of one cent. For all it is worth, we examined the supreme leader’s website, the official and authorised source for his views, speeches, and photos. We found only a couple of unsubstantial declarations, such as those heard in the ads of the vilest multinational polluters in the West, of pretending to go green. 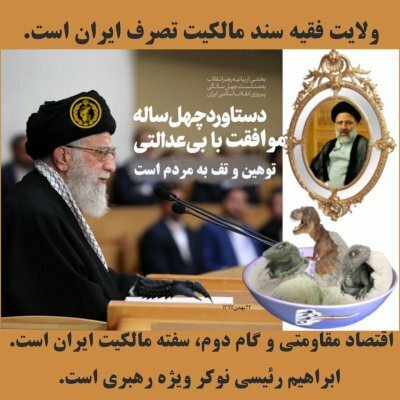 In a complex world where human activity cannot be simply based on people’s beliefs and superstitions alone, an ayatollah is cunning but significantly ignorant. He is an apprentice to the theological seminars, his income is from offerings. He has not planted a field or is knowledgeable in a scientific field related to nature. However, using anathemas, he is the one in Iran to command the fields of biology, agriscience, and any other science related to nature. It is no wonder that their theological thesis, رساله توضیح المسائل, is filled with science negativism ideas. An ayatollah is a mature wise man, born legitimate, alive, just, and a Shiite-twelve Imami follower, as described by the first supreme guide, R. Khomeini. Will he listen to the scientific advisors? Of course, if and only if they say what he wants to hear. His followers are more likely to be the opportunists, as long as there is money to make… a familiar scenario in all human communities, regardless of religion; Islam is not above the others. Worse, being intolerant toward the non-believers, qualified as Najis, stifles merit and hard work to the benefit of religious practices and beliefs, letting the sycophants run the country. The Iranian mismanagement of the economic activities and the environmental issues is conspicuous. The lack of vision and the endogenous incapacity of sound planning and realisation have damaged beyond repair the frail arid and semi-arid ecosystem. Proper regulations, coupled with genuine supervision and surveillance, would have had a positive impact and prevented the depletion of water resources. However, and this is far, very far, from a cheap joke, when the religious authorities fail on an issue, they blame the bad-hijab women, foreign enemies and the West. If the Zayandeh-rud River dries up, at fault are women that stroll the banks, improperly attired. “My office has received photos of women next to the dry Zayandeh-rud River pictured as if they are in Europe. It is these sorts of acts that cause the river to dry up even further,” said the cleric in Isfahan, representing the supreme guide. We have no remedy against the grotesque, but powerful, side of the statements from the Islamic clerics and preachers. We might think of them as funny and even amusing, not expecting a serious discussion, but careful consideration of the implication should be given. Some fans of political correctness in the West would call it a cultural difference. We, born and bred in an Iranian province, call it inane and insane. Despotism and centralised institutions are the only political mechanisms known in the country. The planning starts from ministries in Tehran and then spreads, at a slow pace, throughout the country in every domain: education, health, agriculture, etc. The centralisation gives the theocracy the leverage it needs to further oppress and impose discrimination and division in provinces with large communities of minorities: Turkish Azerbaijanis, Baluchis, Ahwazi Arabs, and Kurds. Any population that voices its demands is left behind in improving the infrastructures and is economically neglected. After four decades, the Islamic Republic still fears diversity, the freedom of speech. It has remained deeply xenophobic. Rahim Hamid, a freelance journalist and co-founder of Ahwaz Monitor website wrote: The Persian elite and intelligentsia have also adopted oppressive social practices that seek to undermine the autonomy, representation, and humanity of ethnic minorities, possibly out of fear that acknowledging the rights of ethnic minorities challenges Persian dominance and could possibly lead to the collapse of the regime. Ali Shamkhani, the secretary of the Supreme National Security Council of Iran, is aware of troubled times ahead for the regime and has warned against the rebellious mood among the Kurds, Ahwazi and Baluch. Most of the complaints we gathered on websites and social media on inadequate water networks combined with pollution, garbage piles, dried water resources, and poor sewage systems came from the provinces shaded on the map below. The shaded zones correspond to those most affected by the pollution and poverty. They roughly cover the provinces populated by minorities and ethnic groups despised by the Tehran rulers. According to the economic statistics, these provinces are also the least developed. Their combined contribution to the GDP is astonishingly low, a tiny fraction of that contributed by the central regions, and the unemployment rates much higher, a multiple of the national guesstimated rates. Today, water supply, sewage systems, and pollution issues are the poor relatives compared with the megalomaniac projects. At all levels, the country’s and the provinces’, assurances are given to do something to solve a given problem. Far too many projects with no future are talked about, and then, even before being pencilled on a notepad, are abandoned. The little that gets done has been achieved through a network of corruption in which might makes right, and the steps taken hardly ever supervised for efficiency. The final result is a tamed administration in the provinces, the stick of a dictatorial system. In these counties, the mood of the population, apathetic and awaiting something nice to happen, is ploddingly changing to a demanding disposition. For now, the administration and the population together push the mess further down the stream, literally and figuratively.Presently, if a domestic issue becomes hot and might spill as milk on the fire, a simulacrum of a plan is hastily assembled. Subsidising daily commodities, the shortage of which would lead to social unrest, is one example of such accommodation: it gives the very-low-income people the confidence of surviving on handouts. And, at the same time, provides more opportunities for swindlers, part and parcel of the theocratic system. However, the Leader has adopted the policy of headlong rush in the pursuit of influencing the politics in the Middle-East, Iraq, Syria, Yemen. Does he dream of reviving the archaic satrapies and ruling them as he does it in Iran? He should look to his own backyard. Agricultural Jihad: Strive for Amateurism!